aram & natalia’s wedding | doberman pizza. 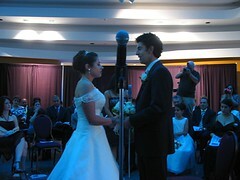 congratulations to aram + natalia on your wedding! it was a beautiful, masterfully prepared Baha’i marriage ceremony, and an excellent dinner and reception – an unforgettable day for all of us. pictures will be going up on my flickr blog for the next week or so! This entry was posted in by the way... and tagged photos, wedding by danger. Bookmark the permalink.